Fava beans pesto has been occupying a line in my “post to do” list since last year. It appeared on April, when this blog was just a work in progress, nothing more than a bunch of ruffled ideas on my mind and on a notebook. The Summer came, and Autumn too. 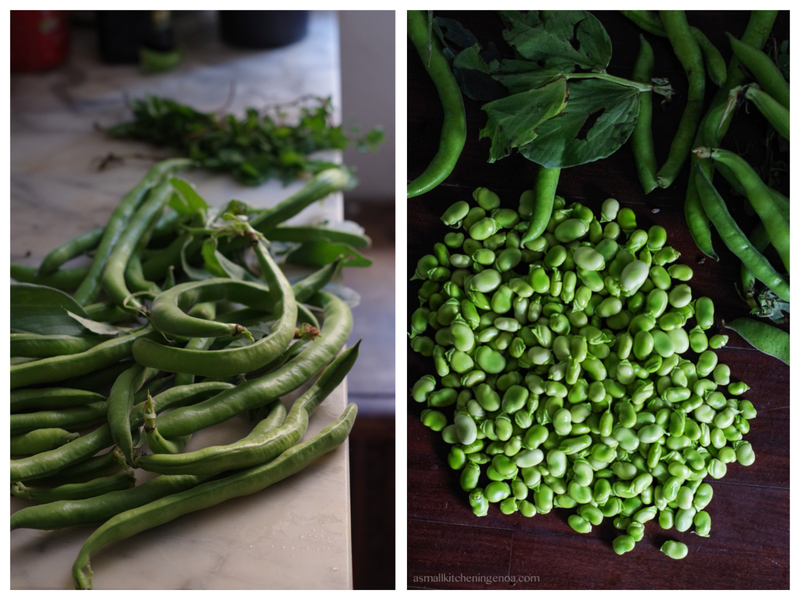 The ideas tided up, my blog went on the air but the fava beans went into hibernation… However, I have been continuing keeping fava beans pesto on the list as I’ve already went fond of it. You always become attached to the first ideas, don’t you? Now, eventually, it’s again the right moment to prepare this recipe (and take pictures to it). Maybe last year it wouldn’t has been the same post. I’ve changed a lot since then. Today I watch things in a different way. I see shapes, colours and beauty everywhere. I’m easily moved by simple things, simple gestures, such as harvesting by myself fava beans in the fields. And then more often it happens to me that I stop and feel the present moment, aware of the exact instant I’m living in: sounds, odours, my body, the people around me, my emotions, the thoughts coming and going away from my mind. Some days ago I actually found myself in the kitchen with a huge bag full of fava beans to clean. Maybe last year I would have got nervous spending more than half an hour in such a repetitive task. Last day, on the contrary, I took two big bowls, I overturned the fava beans bag on the table, I sat at the table next to my mother in law (she was around and offered to help) and started shelling the first pod. And I felt: the silky skin of the pot, the soft cracking when it is opened, the intense smell of herbs and spring coming out, the vinyl skin of the fava beans when shelling them out in the bowl. I perceived the time flowing from a pot and the other. I felt the presence of my mother in law, her company. We made small talks, on things past and on new projects, on people that we lost and on those who fill with joy our days. We chatted of real life, ultimately, which rarely occurs in everyday life when we just came across to swap my son. 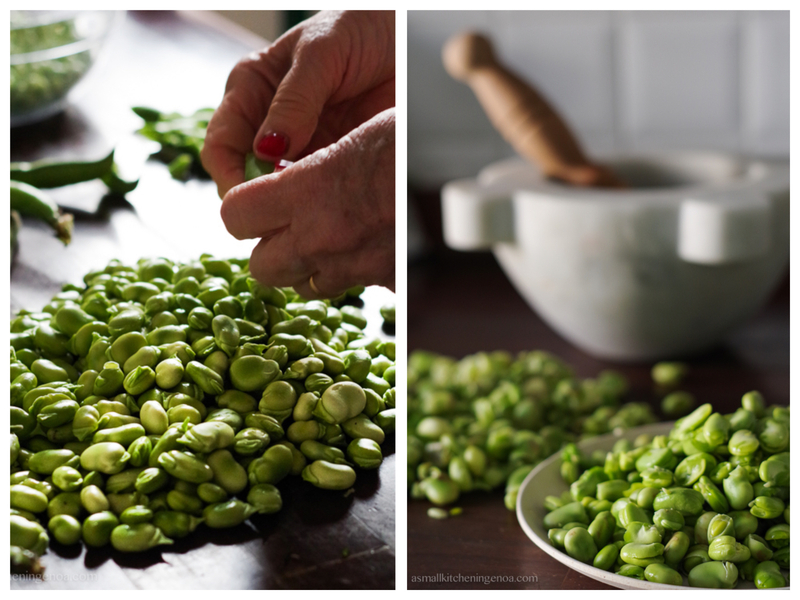 And so I thought that shelling fava beans – as well as shelling peas, trimming green beans or cleaning artichokes – is a noble activity. It’s a precious moment- without guilt – of peace, listening and community. A moment that lasts for as long as it takes, to finish, without hurry. When the cleaning was completed I had to decide whether doing the fava beans pesto with the blender or with the mortar, as the ancient housewives of the West Italian Riviera did. As this recipe had now become the praise of slowness, I could not opt but for the mortar adventure! It was not a tough work nor too long. Fava beans are easy to mash. The only trick (I learned the hard way) is to pour fava beans in the mortar little by little otherwise they will jump out every second! If you are not as nostalgic as I am, you can use the blender, of course. Just be sure to put all the ingredients together, but the oil. 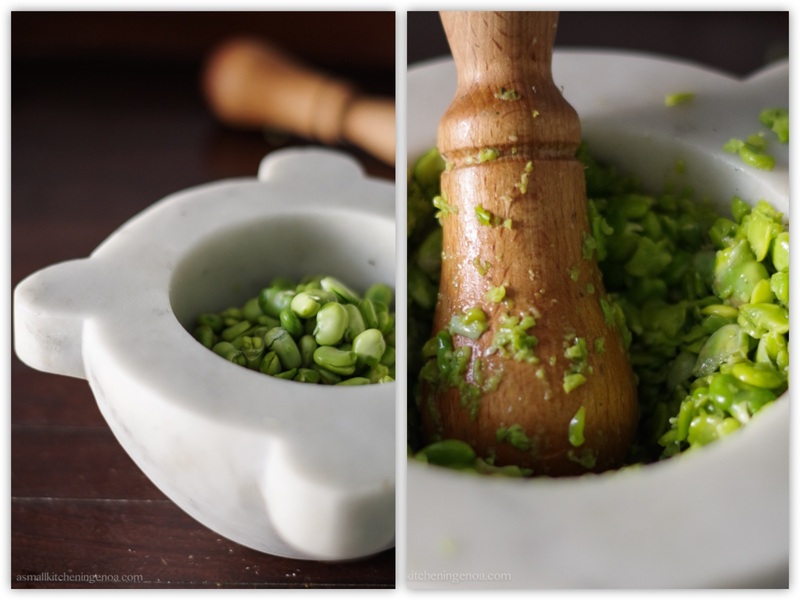 This must be added when the fava beans will have become an uneven puree and gradually, stirring with a spoon. For an excellent, even lighter result, I suggest to use the Garlic of Vessalico (Yep! 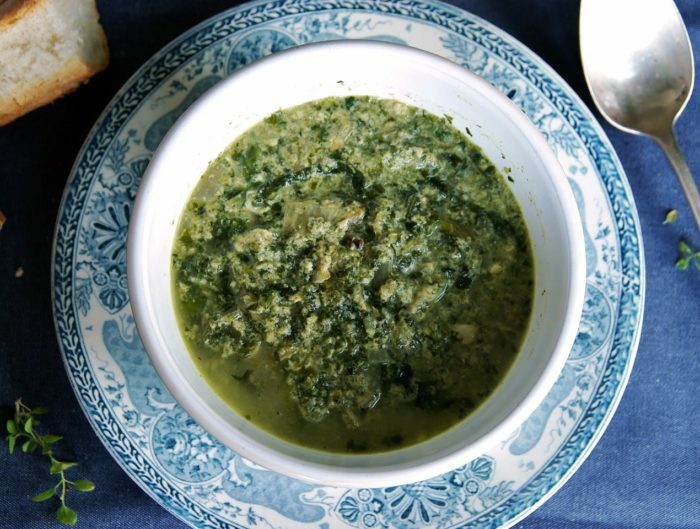 you cannot skip the garlic otherwise this will not be the same recipe), a special sweet, flavoured and high digestible garlic, slow food presidia of the Italian Riviera. And here it is the outcome of my slow work. Below the recipe, some history behind it and some suggestions on how to use it. Crush the garlic in the mortar until it becomes a cream (or use the garlic press), remove from the mortar and set aside. Repeat the same operation with the mint leaves (if you are not using a mortar use a mixer), remove and set aside. Pour the fava beans in the mortar and add a small pinch of coarse salt (it will help to mash and to preserve the bright green of the fava beans). Mash with the pestle until they become a grainy uneven puree. I suggest to add the fava beans little by little. Add the garlic and the mint previously mashed (you can add them little by little and taste each time). Add the two cheeses and stir until they are completely incorporated. If you don’t use the mortar, put the fava beans, the mashed garlic, the mint and the cheeses in the blender all together and mix. Be careful, however, to use the blender intermittently so to avoid that the puree becomes too smooth and creamy. Season with more salt in necessary and some pepper to taste. 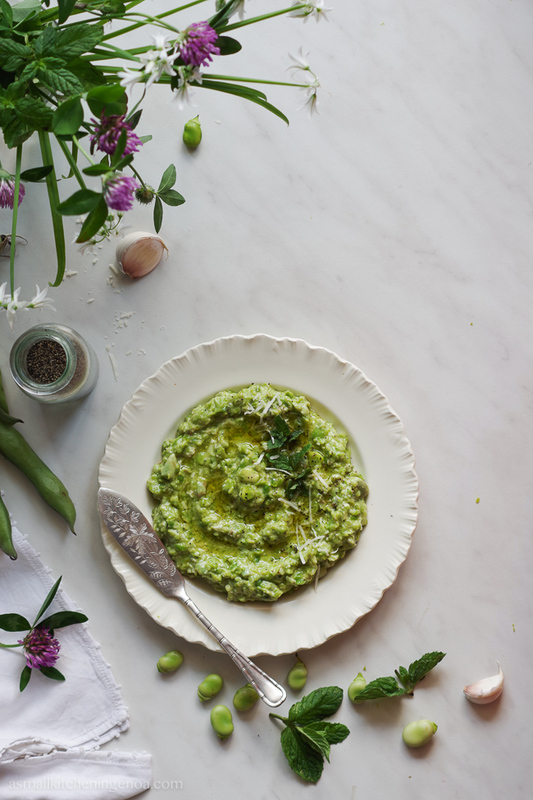 Some history behind fava beans pesto. 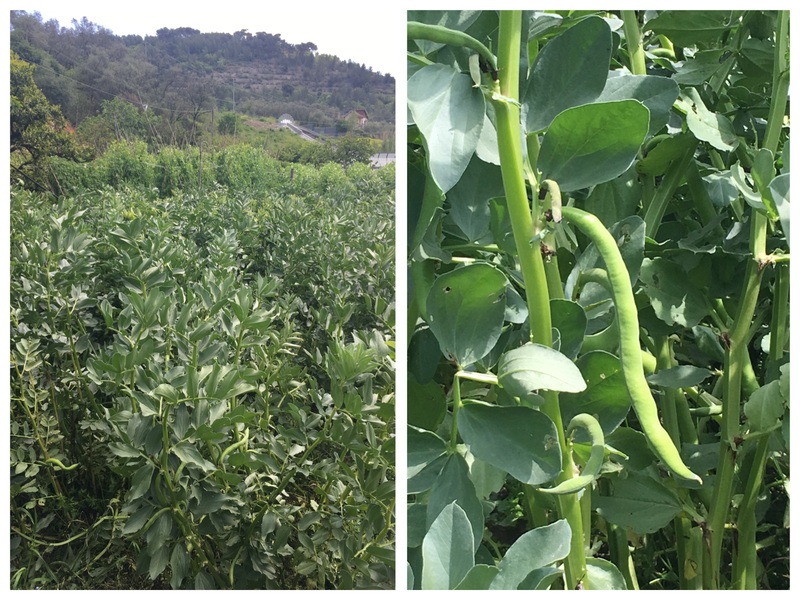 The origins of fava beans pest (also called in the West Italian Riviera dialect “pestun de fave” or “marò“) are very ancient. The word “marò” likely comes from the Arabic “mar-a” which means seasoning. This recipe, therefore, might come from the Saracens invasions (in the lower Middle Ages). And likely the Saracens thought the Liguria peasants to combine this sauce with meat. According to another easier theory, instead, the word “marò” means coming from the mariners. In any case it was a humble seasoning, made by the Liguria peasants with the raw materials at their disposal during spring time and was mostly used to season the bread. 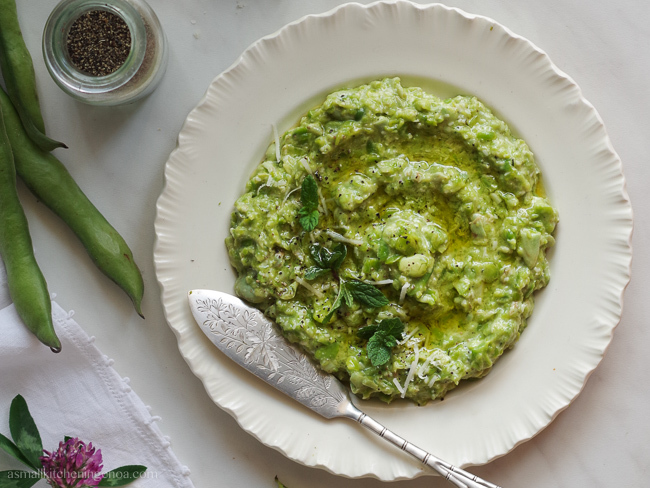 How to use fava beans pesto? Spread on bruschettas. Very easy and as the ancient did. 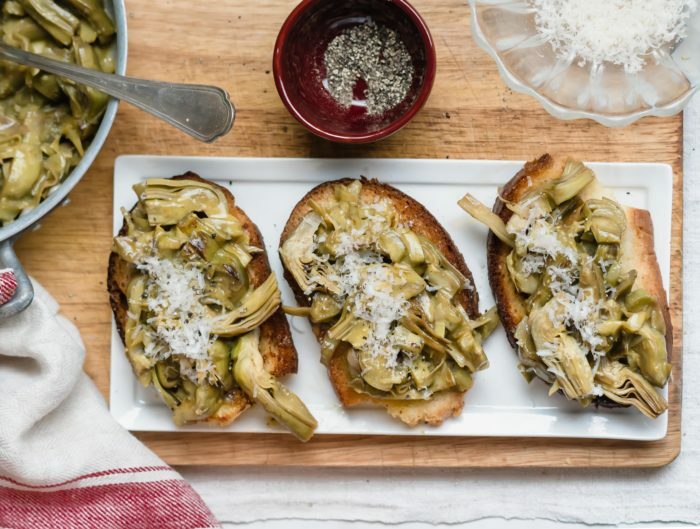 If you want a more strong flavor, rub some garlic on the bread before spreading the fava beans pesto and top the bruschetta with some slices of pecorino cheese. To season pasta. Keep aside some whole fava beans and mint leaves before doing the pesto. Before draining the pasta scoop a couple of tablespoons of boiling water and add them to the pesto right in the serving plate. Pour the drained pasta, add some more parmesan cheese, some extra drops of extra virgin olive and garnish with the whole fava beans and mint leaves. It will be like eating spring! To accompany roasted meats. 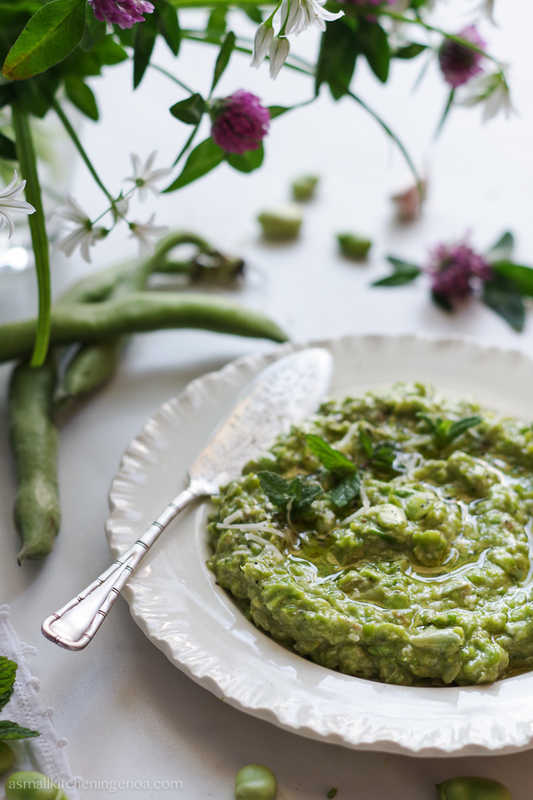 Fava beans pesto is a very fresh sauce and the mint inside will help digest even substantial dishes such as roasted meats. 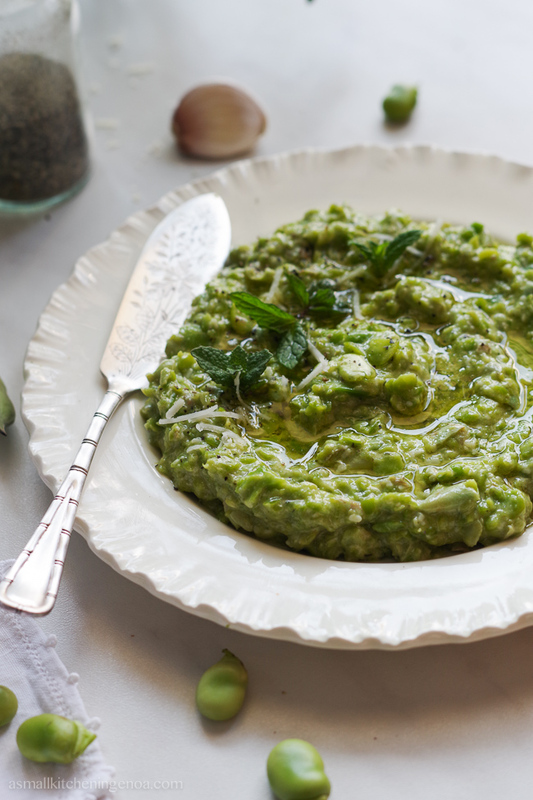 How to preserve fava beans pesto? This is a fresh sauce and unfortunately it does not last too long. But freshness is, by the way, its strength! It is perfect made at the very last moment, but you can preserve it in the fridge, as well, for a couple of days in a closed jar and under a thin layer of extra-virgin olive oil. And don’t miss the future ones subscribing to my NEWSLETTER! Hello, Excellent recipe!! Everyone liked it( we have a similar recipe in lebanon, no cheese but garlic and lemons). About the word mar-a: it actually means pasture in Arabic. Which makes sense since the ingredients would be readily available to Shepherds/peasants.